Winter is here, and snow is falling. A quick look down the street of a residential neighborhood after a snow flurry, and you’ll be instantly reminded of a White Christmas. However, when that snow turns into a blizzard, the situation can get brutal, especially for your lawn. 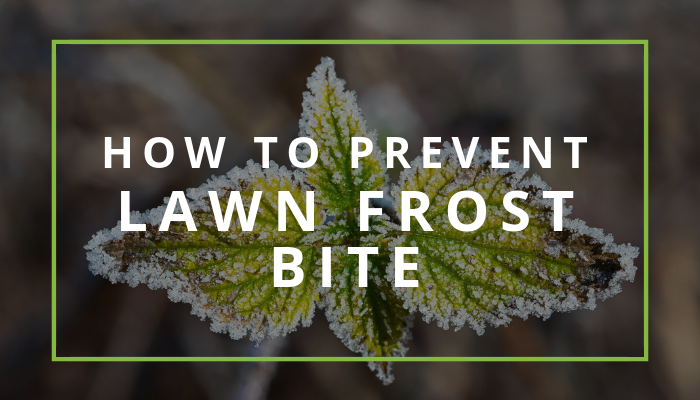 While a frosted lawn may seem pretty on the surface level, there are things going on with frostbite that can pose a huge danger to your lawn. But there are ways you can prevent it. Even though it’s the dead of winter, your lawn still needs water. Believe it or not, droughts can still occur in the cooler months. This causes roots to dry up, whither, and die. Don’t forget to regularly water your lawn. Since it’s not as hot in the winter months, we recommend reducing water intake to about half. We also recommend watering in the mornings as to give the water enough time to get into your soil before nightfall. Grass does not stop growing in the winter, but you’ll likely stop mowing it due to extremely slow growth. It’s important to adjust the length settings on your mower for your last mow of the season. Ideally, you should leave two-thirds of grass blades instead of one-half of blades like you normally would during the summer. This helps to protect the roots of your grass during those nippy afternoons. Alert! If your lawn does happen to get a frost, don’t walk on it. Walking on frozen grass can break the blades and cause damage to your lawn. A big part of your lawn is the plants. Don’t forget to protect them too. Bring any indoor plants in side. If you are under a freeze warning, you can also place frost cloths over your plants to provide added insulation. There are commercial frost cloths available that come with the added benefit of promoting air flow and allow light in. Be sure to adequately weigh the cloth down so they won’t fly away in the night. As your lawn begins to dry out water it to a depth of 1 inch after a day. Even though the ice is melting, that water doesn’t actually make its way into the soil. It evaporates. So it’s important to feed your lawn before it dies of thirst. Wait until your lawn starts growing again before mowing it. When you see it growing past the browning caused by freezing, you’ll know it’s time to mow. Remove any dead blades with a good raking. But wait until the frost has lifted as to not damage your grass. Don’t fertilize too soon. If you add too much nitrogen to your soil after a dehydration, you could end up doing more damage than good. There’s a lot of beauty in snow, but it’s also important to take precautions so that beauty does not turn into a disaster. Winter can be harsh, but with these tips you and your lawn can survive it. No Replies to "How to Prevent Lawn Frostbite"